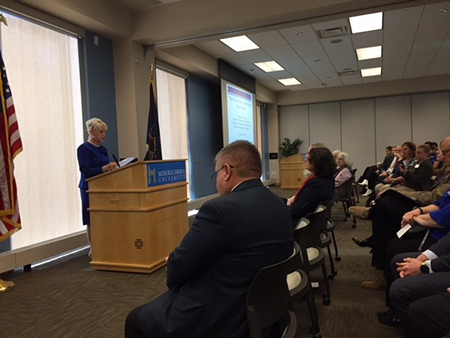 Thursday’s Opioid Update Event at Misericordia University was a very informative event. Thanks to everyone who attended, especially the members of the STOP and HOPE coalitions from Luzerne and Wyoming counties who were on hand to provide information. 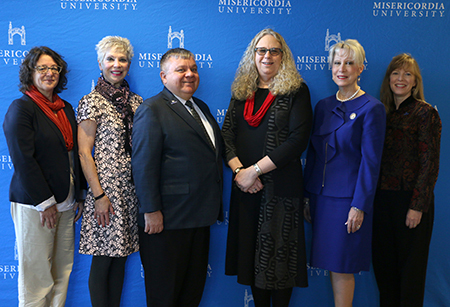 Pictured with me (from left) are Dr. Leamor Kahanov, Dean of Misericordia’s College of Health Sciences and Education; Tunkhannock district office manager Carol Warholak Sweeney; Misericordia President Dr. Thomas Botzman; Department of Health Secretary Dr. Rachel Levine; and Dr. Heidi L.K. Manning, Misericordia’s Dean of the College of Arts and Sciences. 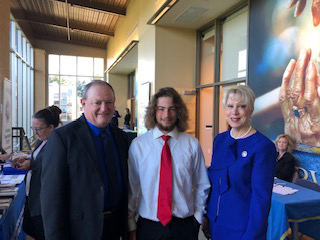 Wyoming County Emergency Management Association Director Gene Dziak and Dylan, one of his interns. Dr. Levine and I discussing House Resolution 1142, my legislation that designates Oct. 19, 2018, as “Lock 'Em Up Day in PA” as a reminder to keep prescription drugs locked away securely in your home. I’m glad to see House Bill 1539, authored by my Luzerne County colleague, Rep. Eddie Day Pashinski, is on its way to Gov. Tom Wolf’s desk. The legislation would allow a grandparent of a child, or other family member related to the child, to petition the courts for temporary guardianship of that child when his or her parent has entered a rehabilitation facility for treatment of a drug or alcohol addiction or has been subject to emergency medical intervention due to abuse of drugs or alcohol. Our current opioid epidemic has exacerbated an existing condition that sees nearly three million children living with grandparents who are responsible for their care. This bill will help grandparents who may not eligible for many of the benefits and assistance given to traditional parents or foster parents. On Wednesday, the Tunkhannock All-Star Little League softball team was honored on the House floor. Please click on the video to watch a recording of the event. If you have state government questions, a member of my staff will be available to answer them this Tuesday, Oct. 23, from 2:30-4:30 p.m. at the Laceyville Borough Building, 324 Church St., Laceyville. A representative from the University of Scranton Small Business Development Center will be at the Tunkhannock district office this Wednesday, Oct. 24, from 10 a.m. to noon. 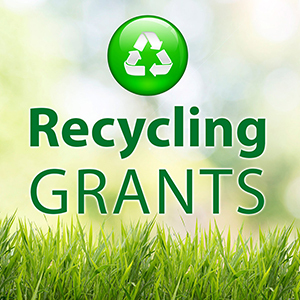 Nearly 200 county and municipal governments are being awarded Recycling Development and Implementation grants for recycling collections and education through the Pennsylvania Department of Environmental Protection. Many of the grants are for community leaf collection programs, as leaf litter cannot be sent to landfills and many municipalities prohibit open burning. The awardees include the Dallas Area Municipal Authority ($207,855) and Wyoming County ($28,572). If you’re good at finding creative ways to solve problems, I have a challenge for you. The Pennsylvania Department of Environmental Protection is searching for individuals who have recently worked on successful environmental projects. 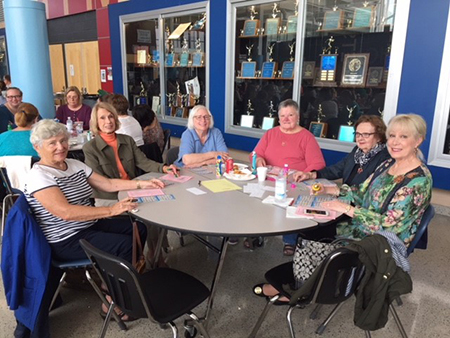 I, along with many other ladies and gentlemen, had a great time last week at the Back Mountain Memorial Library Designer Purse Bingo. As former president of the board of directors, I realize how fundraisers such as this help benefit our library. 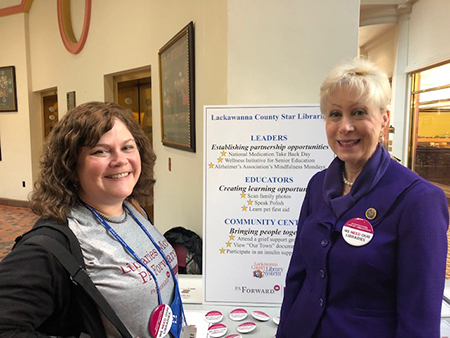 Speaking of public libraries, the state Capitol recently hosted librarians from around the state on behalf of House Resolution 1158, which designating Oct. 17, 2018, as “Libraries Move PA Forward Day” in Pennsylvania. I had the opportunity to meet with Susan Frey Jeffrey, former Back Mountain Memorial Library librarian. The event was well attended and provided our librarians with a plethora of information as well as learning discussions. 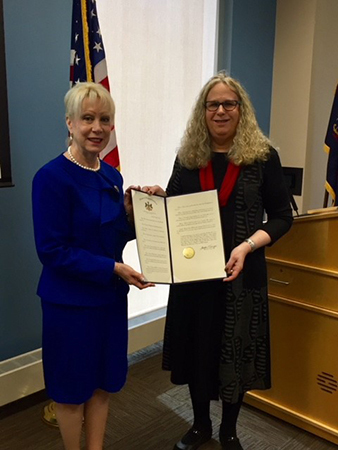 House Resolution 1177, my legislation recognizing Oct. 15-19, 2018 as National Business Women’s Week, has been passed by the House. The week celebrates the contributions of working women and companies that have made strides toward improving working women's lives in their communities. There currently are more than seven million majority-owned, privately-held, women-owned businesses in the United States, employing more than seven million people and generating more than $1 trillion in sales. The deadline to register for my 12th-annual Veterans Expo and Recognition Ceremony breakfast is Monday, Oct. 29. 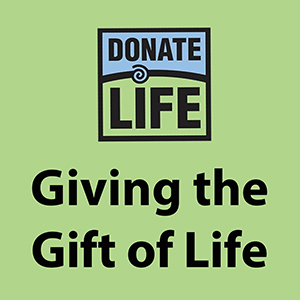 The event itself will be held on Saturday, Nov. 3, from 9-11:30 a.m. at Misericordia University’s Insalaco Hall. The breakfast is open to any 117th District resident who served in our nation’s Armed Forces. Both non-combat veterans and those who served during wartime are encouraged to attend this event, which is being held in conjunction with Metz Culinary Management. To register, please call my office at (570) 675-6000, (570) 836-4777, or toll-free at (800) 278-3939. You can also register online at RepBoback.com.